What is the Demotec Easy Bloc? 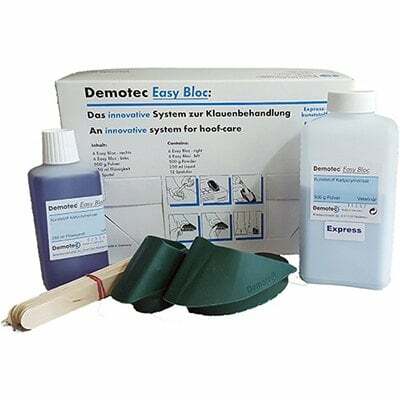 The Demotec Easy Bloc is an innovative system for hoof care. With German development and production behind it, the Easy Bloc is further designed to minimize lameness. It also provides a fast, easy-to-use and safe “cure” at a very reasonable cost. Blocking in dairy cows is a common way to treat lame cows. You can read more about it in our blog post about hoof blocks. A plastic slip-on “shoe” fits onto the healthy claw. This consequently takes the weight off the affected (lame) claw, providing immediate relief of pain and a substantial increase in milk production. Flexible sidewall: allows proper fit for a wide variety of hoof sizes and shapes. Unique sole design: provides greater stability. Green colour: allows for easy identification of treated cows. The Easy Bloc Express resin cures within 2-3 minutes. Also, at cold temperatures, it sets with double the speed. The XXL Version fits perfectly for the claws of large cows. In addition to the above features, Easy Bloc is designed in conjunction with Dr. Adrian Gonzalez, bearing in mind the anatomy of a hoof. We also offer individual Demotec Easy Bloc Express refills. These can be ordered through the options menu on this page. 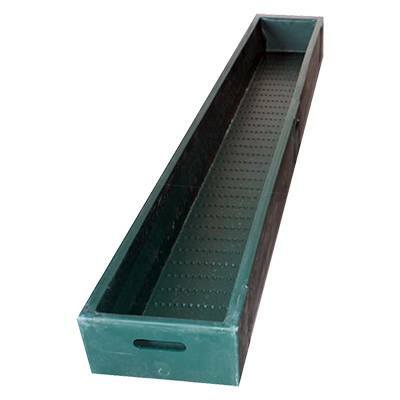 Demotec plastic shoe – available orientations: left and right; available sizes: regular and XXL.